This is one of those recipes that after you've eaten you don't even miss not having meat (if you're a meat eater of course). It sounds like an odd combination, but be brave. It's fantastic. And I don't overrate it. 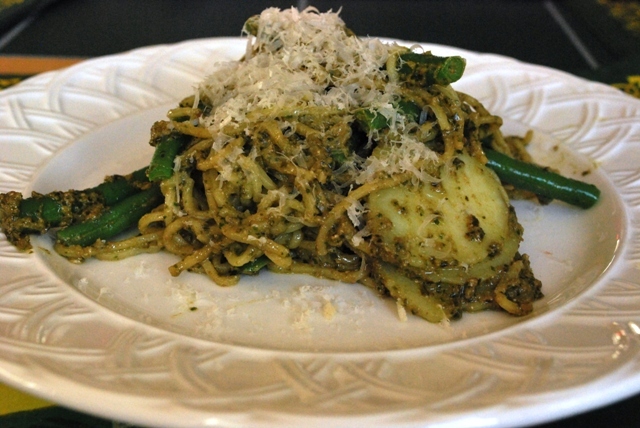 The recipe is for Pasta and Pesto with Potatoes and Green Beans. It comes from Marcella Hazan's Italian cuisine "Bible" The Essentials of Classic Italian Cooking (Alfred A. Knopf, New York, 1996). The recipe appears on page 177; her pesto recipe is on176, hence the reason we saw it. "Marcella Hazan, maiden name Marcella Polini, (born 1924) is an Italian cookery writer who writes in English. Her cookbooks are credited with introducing the public in the United States and Britain to the techniques of traditional Italian cooking. She is widely considered by chefs and fellow food writers to be one of the foremost authorities on Italian cuisine." I won't outline the recipe in detail, but it's a snap, especially if you purchase a jar of pre-made pesto. Just make sure it's good quality. Just like any recipe, the end result is only as good as your ingredients, and in this one the pesto is paramount. Clean green beans and cut in half. Peel and slice some potatoes and cook in salted water until just done, not soft. While potatoes are cooking, bring salted water to a boil in another pot. This is for the spaghetti. Check the length of time your chosen pasta needs to cook. Add pasta to salted water and cook. Five minutes before pasta is al danté, throw in the beans. Boil until pasta is done. Drain pasta and beans and add in potatoes. Stir in pesto (should have 1 cup) and toss. Serve while all is still warm, topped with black pepper and grated Parmesan or Romano. Ever since we found this recipe we've been making our own pesto for it (easy) whenever basil is inexpensive, and fresh enough, to make it worthwhile. We buy large bunches in the spring and summer at the local Farmers Market at a very reasonable price. Try this one. As Hazan says in her recipe: "When all the components are right, there is no single dish more delicious in the entire Italian pasta repertory". If you like this post you can retweet it with the link at the top, or share it using any of the links below.